Together with the oak, Larch belongs to the Italian tradition. This wood can adapt to any treatment: from whitening and pickling, to the sawn effect. It is outstandingly durable and environmentally friendly. "ESEDRA" from "ARMONIE" Collection in version EUROPEAN ELM, finish "Brushed, Lacquered transparent wax effect" Entirely made in Italy. Our craftsmen love oak, the wood of our tradition. Our history! This is why they manage to create classical shapes which show warmth and passion. We look for ancient wood essences all over Europe in order to give your floors warmth and exclusiveness. You can therefore emotionally walk “on” history. 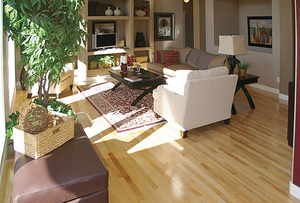 A solid hardwood floor uses natural wood through its entire structure. As a result, it can be refinished many times, extending its useful life. Board thickness is the only limiting factor. Such flooring is usually supplied unfinished or varnished. In some countries such flooring is called "parquet," while in others (e.g., Germany), this term refers only to patterned floors composed of wood squares. This flooring is commonly used in any room of a dwelling. Traditionally, this flooring is at least 23 millimeters thick and is nailed to joists. Very robust, it can be refinished several times. Thinner versions, 10 to 15 mm thick, may be used for remodeling, including installation by gluing. Some types can be laid over radiant floors. Flooring thickness will determine the number of times it can be refinished. Choice will also depend on wood species, its colors, grain and other characteristics. Maple, mahogany, pine, cherry, walnut, oak, jatoba, merbau and other woods can be used for flooring. Maintenance requirements, proper drying and local practices also should be considered.